I’ve always been a fan of toffee — one Christmas I received a big can of Almond Roca in my stocking and thought I had hit the jackpot — but never considered making it at home. Candy thermometer? Tempering chocolate? Forget it. 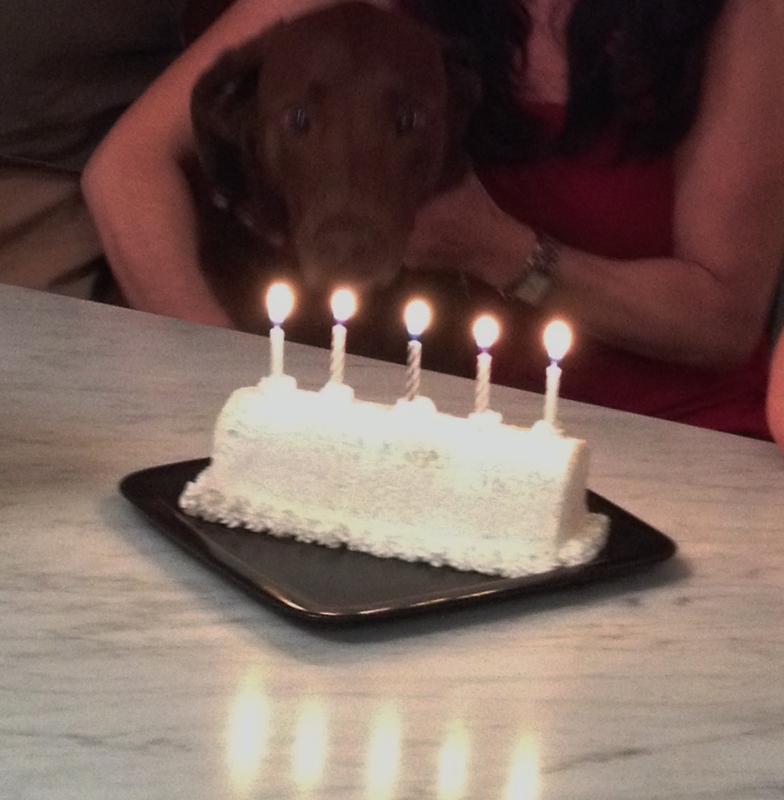 But, we are in the Confections section of my Chocolate and Showpiece class and toffee was on the docket. It turns out it’s not so hard. To eliminate any stress, though, I do recommend a candy thermometer. They’re fairly inexpensive and sugar is extremely temperature sensitive — a few degrees difference in heat makes an enormous difference in the outcome of your confection. As for the tempering, you can sidestep any of the rigamarole associated with large-batch tempering, which can be very touchy for even a moderately experienced baker, by using a shortcut. Here’s the thing about the shortcut, though — you have to do it as described. Don’t shortcut the shortcut. This recipe is adapted from Chocolates and Confections by Peter P. Greweling, CMB. Chef Greweling, an instructor at The Culinary Institute of America, is quite precise in his discussions about chocolates and confections. The depth with which he discusses the topics might seem intimidating but the photographs, which are gorgeous, are inspiring. The recipe is written to yield 60 oz., which is quite a bit of toffee for an average person. We made a half-batch in class, split it between two people, and both had a decent amount to take home with us. We also only coated one side of the toffee in chocolate — easier, faster, and quite sufficient — which means that if you only want to coat one side with chocolate you would want to cut the amount of chocolate, nuts, and the salt for the nuts (not the salt for the toffee mixture) in half for a whole batch, or quarter it for a half-batch. Note: Have a silicone baking mat and an off-set spatula or rubber spatula laid out and ready for the hot toffee when it comes off the stove. You will need to work very quickly to get it out of the pan and spread smoothly on the mat before it cools. Combine the butter, sugar, water, and salt in a saucepan. Bring to a boil, stirring constantly. Once it comes to a boil, continue cooking over moderate heat to 298 degrees Farenheit while stirring constantly. Do not be concerned if the sugar seems to sit at a certain temperature without budging for awhile. Just keep stirring and watching — the temperature will shoot up suddenly. When the mixture reaches 298 degrees, take it off heat and add the vanilla extract. Stir well. 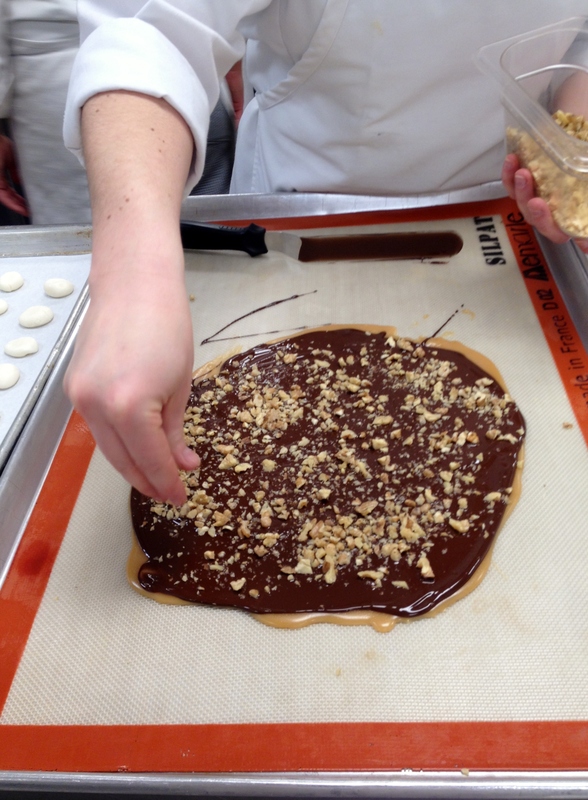 Pour quickly onto the silicone baking mat and spread to desired thickness before the toffee sets. Allow to cool completely. I suggest not working the toffee too much once you pour it out — just smooth it quickly to the thickness you want. You will be breaking it into irregular pieces, anyway, so you don’t need to fuss with it too much at this point. While the toffee is cooling, temper your chocolate. This shortcut is good for relatively small amounts of chocolate. You want to use bar chocolate, not chips, because chips generally have vegetable oil or other emulsifiers in them — they won’t harden back up the way you want. Chop the chocolate into small, even pieces and place in a microwave-safe bowl. The goal is to heat the chocolate very, very slowly. Do not rush this. Microwaves, and the amount of chocolate you are using, vary so it’s not possible to give precise times for this but start slowly. Microwave for about 30 seconds — you can even reduce the power on your microwave to 50% if you know how — and stir it well. It should have melted a little. Microwave it again and stir it. Keep doing this, stirring well each time you take it out. When the chocolate is about 85% melted but still a little chunky, just stir it until the chunks melt and the chocolate is smooth. 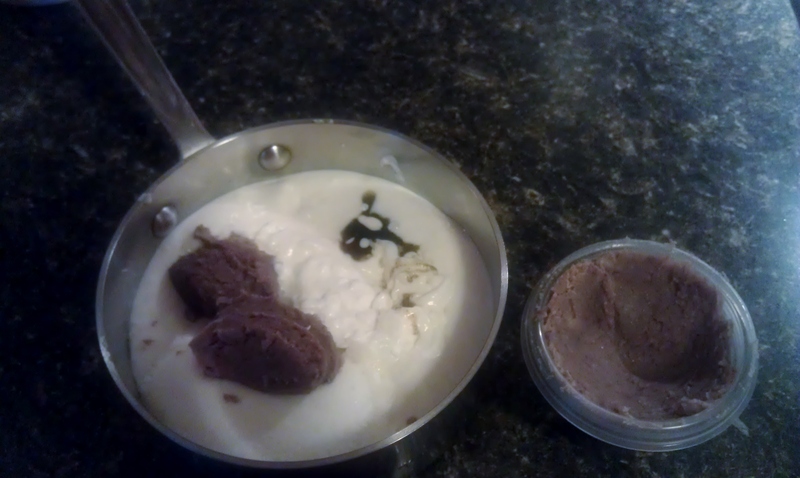 Expect this process to take about 6 turns (or more depending on how much chocolate you are tempering) in the microwave. The most important part of this process is to not overheat the chocolate in any way. It’s easy to burn chocolate, which would be a bummer, but even more importantly, chocolate that is heated too high, even if it doesn’t burn, may not set properly. You are only heating the chocolate enough to get it melted and smooth. Now the chocolate is ready to pour over the toffee. Once the toffee is cool, blot it with a clean towel to remove any excess oil from the surface which would prevent the chocolate from adhering. Coat one side of the toffee with half of the chocolate (or, all of the chocolate if you are only coating one side) by pouring it on and smoothing it out with a spatula. Immediately sprinkle the toasted, salted nuts onto the chocolate. Allow the chocolate to set. How long it takes chocolate to set depends on how thick you poured the chocolate, etc., but I’d say give it a good 20 minutes to start. Turn and repeat on the other side of the toffee if you are coating both sides. Break into desired-sized pieces. Store protected from heat and humidity. When fresh, the toffee should be crisp and crunchy to the bite. As the toffee picks up moisture from the air, it will become softer to the bite and stickier to chew. 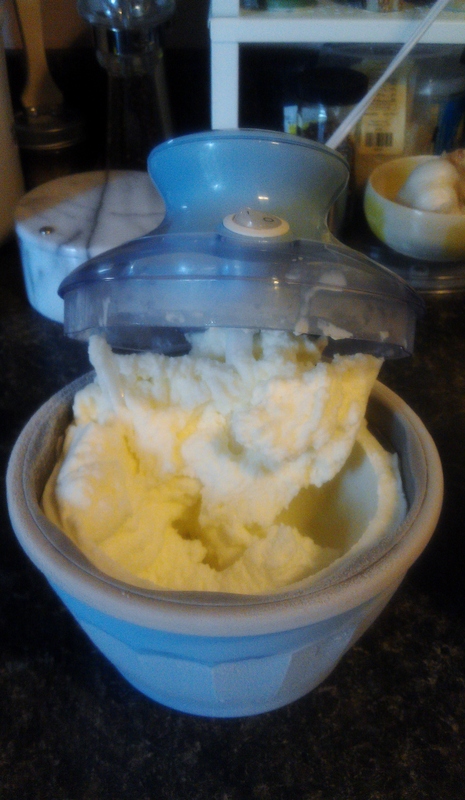 I love my KitchenAid Stand Mixer. I still remember the day I brought it home, so proud and excited…I had dedicated my whole tax refund to it that year and I couldn’t be more pleased for having it. I felt like I’d hit the Big Time. It’s still my favorite appliance. One of the perks of having a KitchenAid is that the mixers have the benefit of accepting attachments and KitchenAid makes sure there are plenty of tantalizing — and expensive — attachments from which to choose. 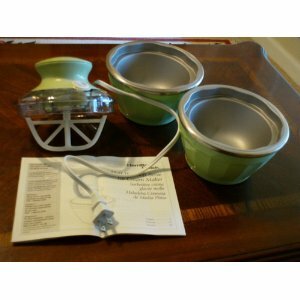 One year, for Christmas, Santa brought me the highly coveted Pasta Maker attachment. I was SUPER excited. And then I waited almost a year to try it because I was intimidated by it. I’m not sure why. One day I was visiting my friend and her mother-in-law decided to make pasta like it was no big deal. So, I watched her. And, it’s no big deal. Of course, she has been doing it for years, so it looked even easier and smoother than it actually is the first few times but, with a little practice you’ll see there’s nothing to fear. I decided to try making some Spinach pasta the other day. I had the last of my summer pesto to use and a handful of pine nuts looking for a place to land so I gave it a whirl. Spinach has quite a bit of moisture in it, so it requires a little extra handling when you are sheeting it (putting it through the rollers). I learned this after the fact. Other advice? Don’t fall so in love with the way your pasta looks that you set it down to take pictures of it because what used to be an ethereal delicacy of thinness is now a hot mess of clumpy fresh pasta. Have the back of a chair at the ready for draping. Sheeting it on the lower settings (I had to keep adding flour as the rolling released more moisture from the spinach). Working its way up the settings to thinness. You can see the color of the dough is becoming more homogenous. Quite thin — this is at about a 7 — so thin you can see your fingers through the dough. It only looks wobbly because I am using my other hand to take a photo instead of guiding the dough. …because you’ll end up with this. After sheeting, you switch to the cutting attachment. I used a bowl to catch the pasta since there wasn’t any counter underneath, but it’s actually better to catch it with your free hand and lay it onto a rack, chair back,or just swirl it immediately into bird’s nests for holding. Place chopped spinach, water, eggs, and flour into mixer bowl. Use beater paddle to mix 30 seconds on Speed 2 (low). Exchange paddle for dough hook. Knead 2 minutes on Speed 2. Remove dough from bowl and hand knead for 1-2 minutes. 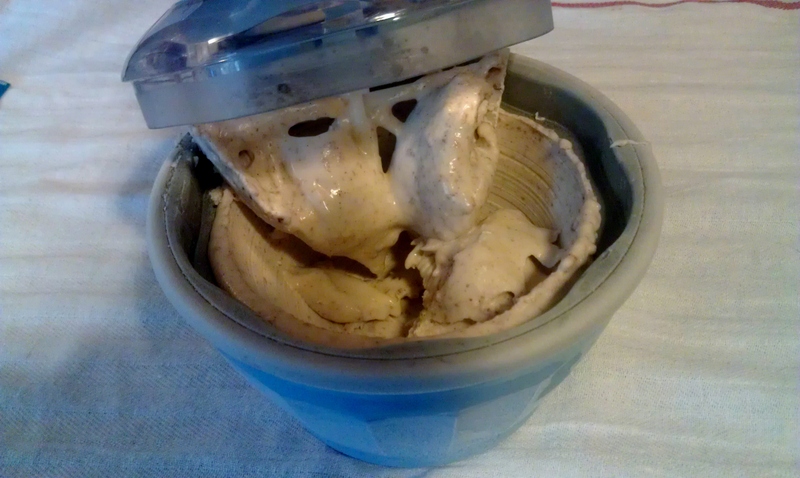 Divide dough into 8 pieces and process with roller attachment. Cook as you would dry pasta, but adjust cooking times down. Fresh pasta takes considerably less time to cook than dry pasta. Check after 4 minutes. Try This At Home, Kids! 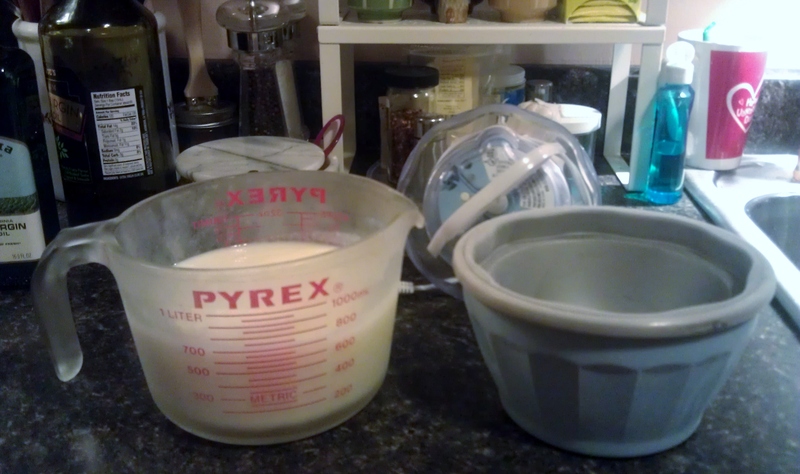 There are lots of baking and pastry photos I take in my labs which don’t necessarily make it into a specific blog post. You can see these photos, and other interests, on Facebook on my Bean Pie And Baking page, so “Like” us on The Book! You can do that by clicking the link, or by finding the “Like” button on the right-hand side of this blog post. And this semester, especially in my Advanced Pastry class where we sometimes divide up to produce a dozen different items, I’m coming across a lot of really good recipes. So, if you see a photo which interests you and are thinking you might want to try it at home, let me know. It’s highly likely that I could share the recipe. Here’s a recipe we tried out last week in class. Pretty tasty, and fairly straightforward. 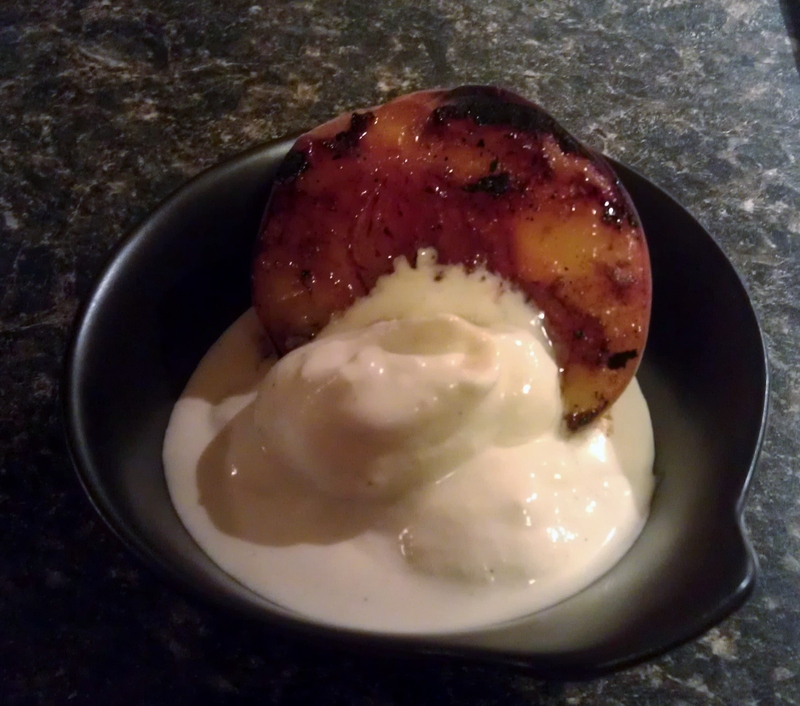 The recipe calls for fresh figs, but we used dried figs in class and it was very nice. My only advice if you are using dried figs might be to consider the size of the serving pieces relative to the size of the sliced figs. These figs look gorgeous, but they were a bit of a mouthful. Dried figs are sticky and don’t bite cleanly — you need to take the whole piece in one bite, and half a fig can be a bit much for one bite. It can also push the goat cheese-to-fig balance a bit out of whack. 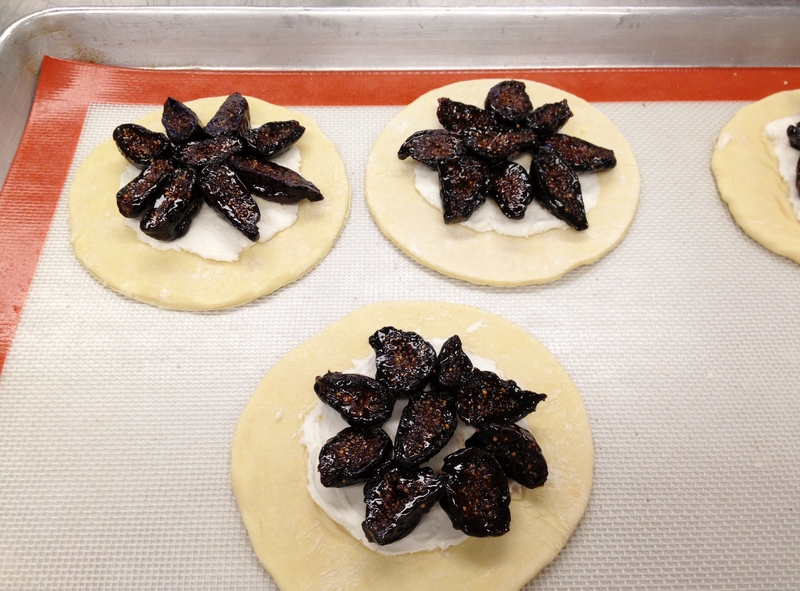 Fig and Goat Cheese Galette before the edges are turned up and the galette is baked. Combine the water, brandy, sugar and star anise into a sauce pot and bring to a boil. Cut the figs into halves or quarters (stay on the smaller side if using dried figs). Lower the heat on the poaching liquid to a simmer and add the figs. Mind you don’t boil them — keep them at a gentle simmer — you don’t want them banging around the pot getting disfigured. Poach the figs until the skin is tender, but before the meat begins to break down. Remove the star anise. Cut the puff pastry into 5″ circles (or 4 1/2″x4 1/2″ squares) and place onto a sheet pan lined with a silpat (or parchment paper). Evenly distribute the goat cheese on each of the circles, and spread it leaving a 3/4″ rim without cheese. Arrange the poached figs decoratively onto the cheese. Fold the edges of the galette up and over toward the goat cheese to form a crust. Bake at 375 degrees F until the pastry is golden brown. Cool the galettes, then drizzle a small amount of honey onto each one. Cuckoo For Coconut! And Quick Pickled Cucumbers. And Thai Melon Salad. Here’s what happened: global warming. It has been hot hot hot all over the nation and Maryland is right smack dab in the middle of it. (The heat, not the nation. Unclear pronoun reference. Deduct 5 points.) It has been so hot here (“HOW HOT IS IT? ?” — I don’t have a punchline for this) but more oppressive than the heat is the humidity. I walked to the car at 10 AM last week and as long as it took me to get my keys ready my hands were moist like I was about to go on stage. Humid. Your-lungs-feel-wet humid. Mercy. Anyway, it’s not really cooking weather except for some quick grilling, so I pulled out a recipe I found awhile back for Sichuan (Szechuan) Cucumber Pickles and now I can’t stop nomming on them. Pair this dish with a Thai Melon Salad from my cooking school textbook and a recipe for rice cooker coconut rice I am seriously bananas for right now, and you’ve got some goodness happening. Throw some lightly marinated chicken breast tenders on the grill the last 5 minutes of prep and you are set. Nutritious, cooling, and a crazy amount of texture. Pan-Asian delight. Both of these salads should be made a few hours before serving leaving you plenty of time to put your feet up and drink some sweet tea before dinner. 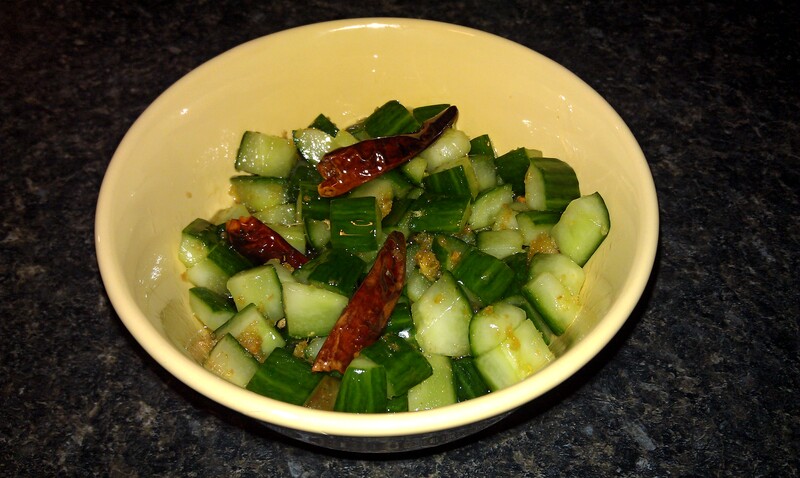 First up, Sichuan (or Szechuan) Pickled Cucumbers. First of all, I love sesame oil and its distinctive flavor makes this dish, so I can’t imagine subbing it out for any other oil, so don’t you try it, either. Well, I mean, you can if you want to, but… Next, a neat trick for “peeling” fresh ginger is to actually scrape the peel off with a spoon. Works like a charm and is not nearly so wasteful as peeling it with a knife or traditional peeler. While we’re on the subject, a spoon is just the ticket for scraping the seeds out of the cucumber wedges, too. And while the Szechuan peppercorns are optional, I’ve tried it with and without and although I love the tongue-numbing taste of Szechuan peppercorns, I would grind them first since they are a bit distracting if left whole. Halved, quartered, seeds removed, and diced. 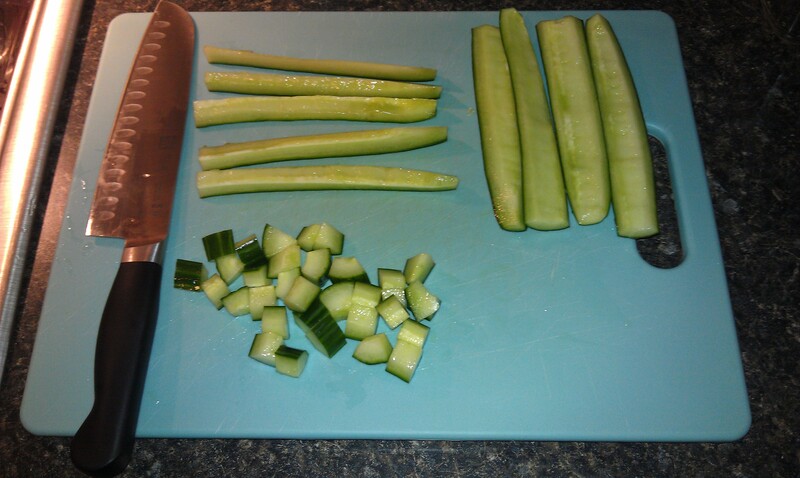 Halve each cucumber lengthwise, then halve again to end up with long quarters. Scrape the seeds out, then chop. The recipe calls for 2-inch pieces, but I dice to medium. Toss cucumbers with salt in a bowl and let stand 20 minutes. 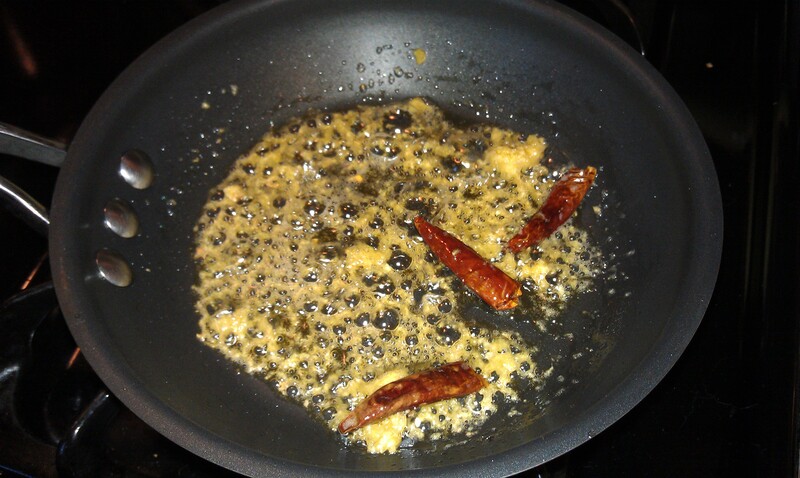 Stir-frying the ginger and chiles in sesame oil. While the cucumbers are salting, heat sesame oil in a wok or small deep skillet over moderately high heat until just smoking. Stir-fry the chiles and peppercorns for about 30 seconds or so, until the peppers turn dark. Add the ginger and stir-fry, being careful not to burn the ginger – it can happen quickly. Remove from heat and cool completely. Cucumbers salted, rinsed, and patted dry. Rinse cucumbers well, drain in a colander, and pat dry. 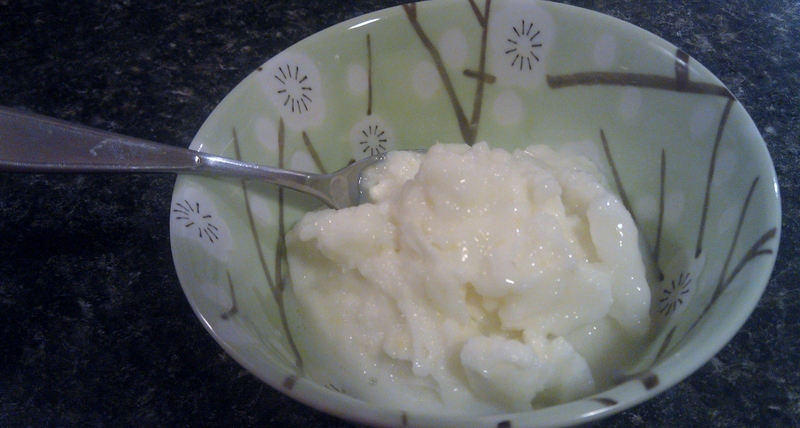 Stir together the rice vinegar and sugar in a medium bowl until sugar dissolves. Add cucumbers, tossing to coat. Pour spiced oil over cucumbers and toss well. Marinate at room temperature for 3 hours before serving. 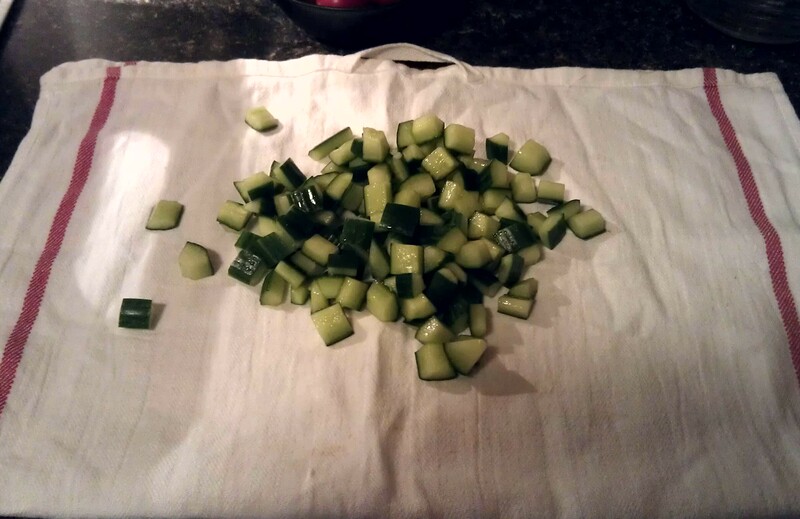 The cucumbers can marinate, covered and refrigerated, for up to 4 days; stir occasionally. The longer the cucumbers marinate, the spicier they will be. Note: Leaving the seeds in the chile peppers will make a considerable difference in their heat level. Adjust accordingly. Makes about 6 cups. 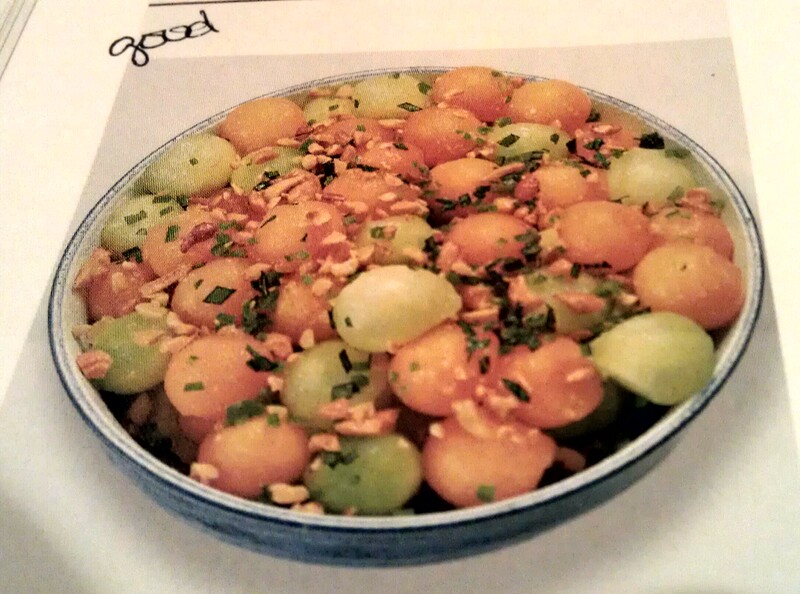 Next up, Thai Melon Salad (my textbook calls it a salsa, but I prefer to use it as a salad). Thai Melon Salad picture snaked from my textbook. Super low-tech photo, but you do get to see my advanced recipe ranking system. Cut the melons into small dice, or shape into small balls using a parisienne scoop. Combine the remaining ingredients and toss with melon pieces. Chill thoroughly. Garnish with more mint before serving, if desired. Serve with fish, shellfish, or chicken. Yields 1 quart. And then there’s the rice. Don’t let the exceedingly dark photo fool you — this stuff smells so amazing cooking that you’ll want to clap your hands. 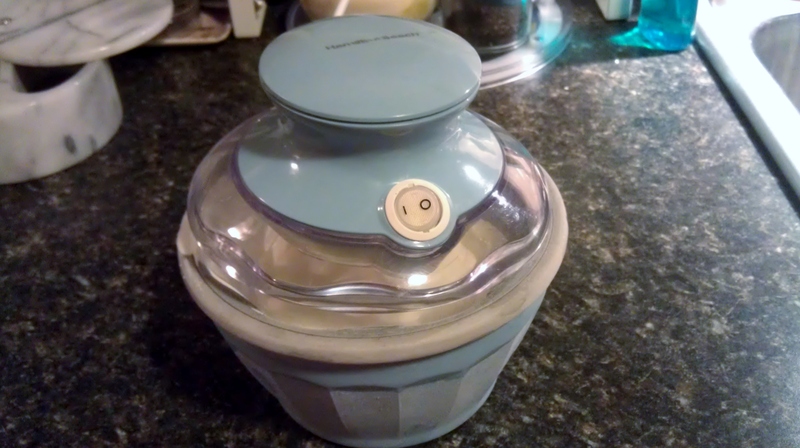 Rice Cookers…I know, I know. I used to be against rice cookers — uni-taskers, and all, blah blah– but now I’m converted since it babysits its own self and leaves all my stove burners free — can’t argue with that! I have unintentionally left out the salt on two occasions and the rice tastes just dandy to me, so you may want to try it, too. 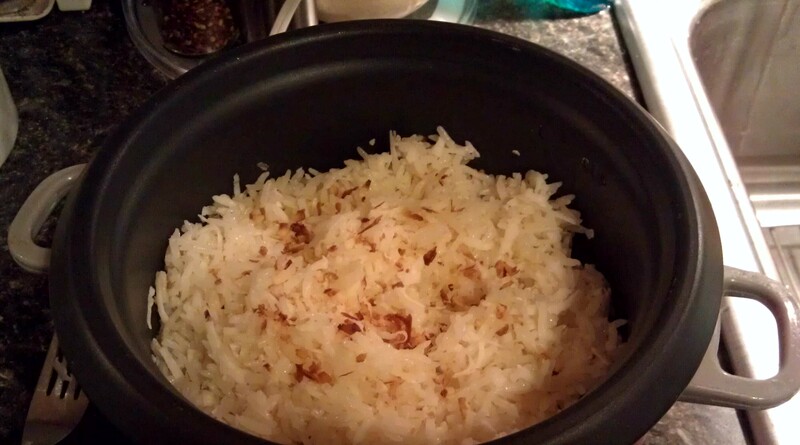 Combine all ingredients in the rice cooker. Stir to combine. Activate the rice cooker and let it do its thing. Allow to sit 10 minutes after it finishes cooking. 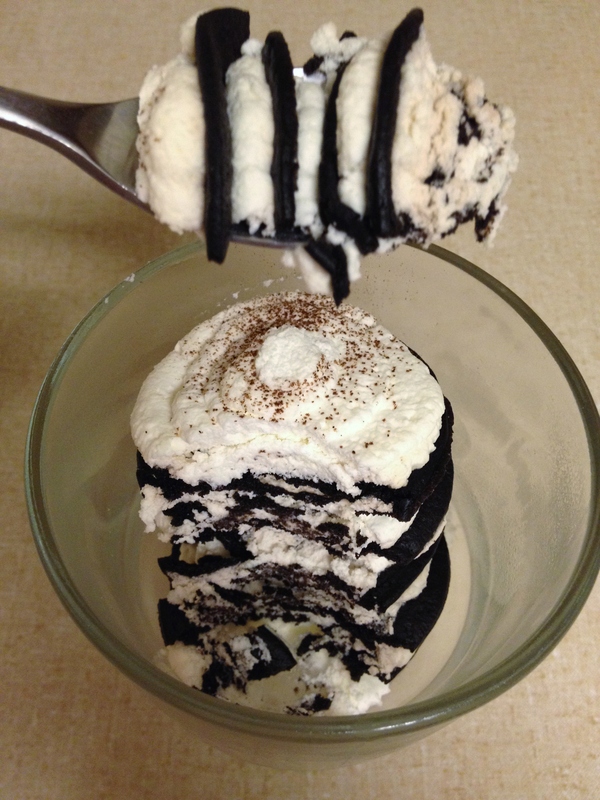 Fluff with a fork before garnishing (see below) and serving. Serves 4. Note: I highly recommend taking another 3-4 tbsp. shredded coconut and toasting it lightly in a pan over med.-high heat until the coconut begins to release its oils and browns. This can be done while the rice is bubbling away in its cozy coconut milk bath. Crumble toasted coconut over rice before serving. And the chicken? Well, y’all know how to cook chicken, so I won’t bother with that. But, I will say that I came late to the party when it comes to chicken breast tenders. And now I’ve fallen hard. Sauteing or grilling them literally take about 3-4 minutes per side (if that). There’s not even time to walk away so it’s easy to avoid overcooking them and drying them out. Just remember to cut out that tendon at the tip, because it’s super annoying to chew on that. Really harshes the chicken tender mellow. I chucked mine in a quick marinade of soy sauce, mirin, ginger and oil as I put the rice on, and 25 minutes in the bag was just about right to keep them juicy on the grill without overpowering their mild meat. And that’s it. That’s the hot weather dinner du jour. So grab some sweet tea and enjoy!